The magazine for managers of change in education. Download the Table of Contents of the past 15 years for a quick review of the kinds of research, development, issues and challenges being published in the field of educational technology, what follows are the articles published in Educational Technology since 2000. 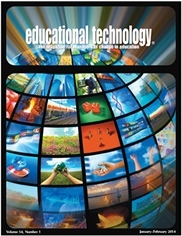 Educational Technology Magazine is the world's leading periodical publication covering the entire field of educational technology, an area pioneered by the magazine's editors in the early 1960s. Read by leaders in more than one hundred countries, the magazine has been at the forefront of every important new trend in the development of the field throughout the past five decades. Its list of published authors is a virtual "who's who" of the leading personalities and authorities from all over the world active in educational technology research, development, and application. Its stimulating, provocative, challenging articles are eagerly awaited by its loyal readership. It has also published more scores of special issues that have defined the field and created whole new areas for research. There is no other periodical that approaches its high level of prestige within the field of educational technology. The senior editor is Lawrence Lipsitz, who has personally known every leading authority in educational technology since the 1960s, and who today continues to be in direct daily contact with all of those doing the finest, most up-to-date thinking in this field. The magazine's book division, also headed by Lawrence Lipsitz, has published more than three hundred books since the 1960s, many of which are classics in the literature and a staple of advanced courses in departments of educational technology and instructional systems design. Published six times annually by Educational Technology Publications. To inquiry about the magazine contact edtecpubs@aol.com.